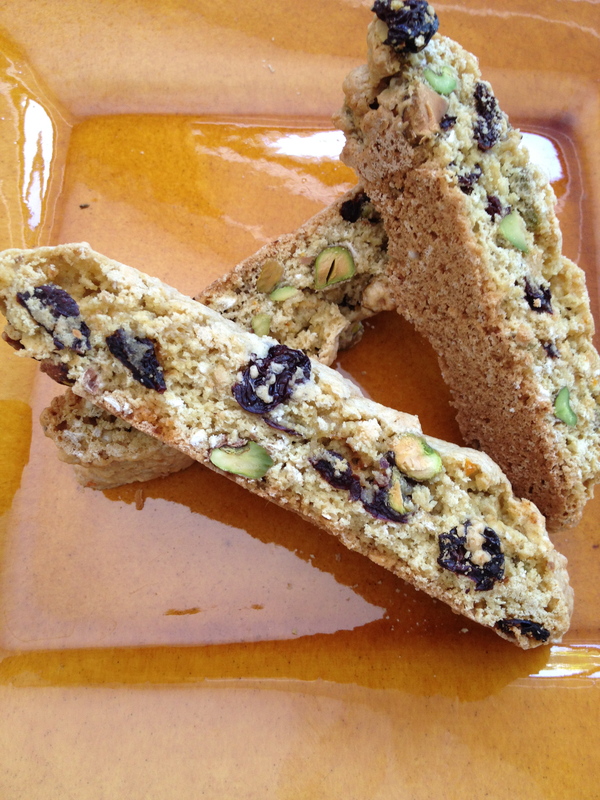 A few months ago I posted a recipe for crumbly dried cherry and pistachio biscotti. Using basically the same recipe, I ‘mastered’ (in the most amateur sense of the word) the art of preparing these crunchy cookies as regular-sized biscotti. They last for about a week in a Ziploc sealed bag or airtight container. 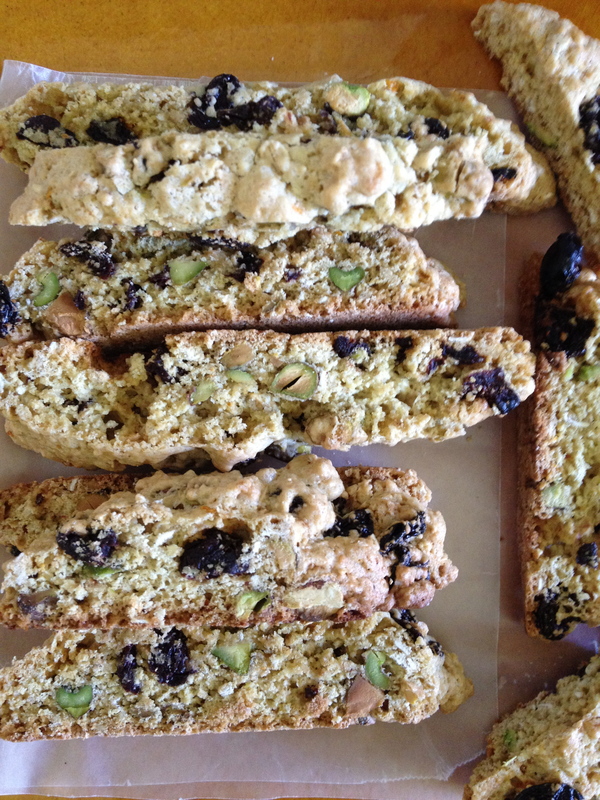 These biscotti exude the most delicious fragrance that infiltrates your home for hours even after they are done baking, and no matter how hot to the touch, you will not be able to keep your fingers to yourself as soon as they emerge from the oven. Pre-heat oven to 350 degrees. Line a baking sheet with parchment paper. Combine the flour, sugar, oats, baking soda, baking powder, and salt in the bowl of a stand mixer fitted with the paddle. Mix on low speed until just combined. In a separate bowl, whisk together the eggs, grapeseed oil, orange zest, vanilla extract, and almond extract. Add the egg mixture to the flour mixture and beat until just combined. Don’t overbeat or the dough will get tough. Mix in the cherries and pistachios. Scrape the dough onto a lightly floured surface and divide in half. Shape each half into a log and transfer to the baking sheet. Flatten the logs with your palm so that they are about 2 inches across. Bake for about 30 minutes until browned. Let cool for 15 minutes. Transfer the logs to the cutting board and cut on the diagonal into 1/3 inch slices. Stand the slices up on the baking sheet (this seems to be the best way to ensure their sides cook evenly) and bake for about 40-45 more minutes or until as crisp and browned as you desire. Let cool before storing in an airtight container.